Raised in an educated and intellectual family with no faith, but who apparently went through some of the motions since she received her first Communion on Christmas 1829 at age twelve. She had a conversion experience, came to the faith, and felt a call to religious life by hearing the Lenten sermons of the Dominican Henri Lacordaire at the Cathedral of Notre Dame in Paris, France. She made a short novitiate with the Sisters of the Visitation at Cote Saint-Andre, but did not take vows. During a pilgrimage to the shrine of Sainte-Anne d'Auray in 1825, Eugenie felt called to found a teaching institute that would work in the world, but kept monastic observances. In 1839 she founded the group later named the Congregation of the Assumption (Religious of the Assumption, Sisters of the Assumption) to perform this mission. The Assumptionists received papal approval in 1888, and continue their good work in 34 countries around the world today. Walter Ogilvie was a Scottish noble who raised his son John in the state religion of Scotland, Calvinism. John converted to Catholicism at age 17 at Louvain, Belgium, and then attended several Catholic educational institutions. He joined the Jesuits soon after in 1597, and was ordained in Paris, France in 1610. Sent to work in Rouen, France. It was a time of great persecution of Catholicism in Scotland. "Send only those," wrote the Earl of Angus to the Jesuit General, "who wish for this mission and are strong enough to bear the heat of the day, for they will be in exceeding danger." Wholesale massacres of Catholics had taken place in the past, but by this point the hunters concentrated on priests and those who attended Mass. The Jesuits were determined to minister to the oppressed Catholic laity, but when captured, they were tortured for information, then hanged, drawn, and quartered. Ogilvie repeatedly requested assignment to his home Scotland, and it was finally granted; he returned in November 1613. He worked as an underground missionary in Edinburgh and Glasgow, dodging the Queen's priest-hunters, disguised as a soldier named Watson. After 11 months in the field (and on the run), John was betrayed by a phony Catholic, imprisoned, interrogated, then tortured for the names of active Catholics. He gave no information. "Your threats cheer me; I mind them no more than the cackling of geese," he told his captors. Asked if he feared to die Father John replied, "No more than you do to dine." After three trials he was convicted of treason for being loyal to the Pope, and denying the king's supremacy in spiritual matters. He is the Church's only officially recorded Scottish martyr. Born a sickly baby in a deeply religious peasant family; had to be quickly baptized as they did not think he would survive. Nearly died of tuberculosis at age 12. His father died soon after, and Elias had to support the family. Admitted to the Augustinian college of Yuriria at age 22, considerably older than the standard admission age. Took vows in 1911 as Elias del Socorro. Ordained on 9 April 1916. Parochial vicar of the village of La Canada de Caracheo in 1921. During the government persecution of the Church, he refused to a city where he could be controlled; moving instead to nearby hills where he continued to serve his parish, usually under cover of dark. Arrested with some pious laymen, and martyred on the side of the road for his faith and service. Son of Castinus. Held the pontificate during the end of the Roman Empire. He defended the Council of Chalcedon against the Monophysites heresy of the Eastern empire. Worked for the Italian people against barbarian invaders. Built four large churches in Rome, and brought some order and organization to the administration of the sacraments in the local churches, bringing the focus back to the sacrament rather than the place of its administration. Opposed Emperor Leo who wanted to officially make the Patriarch of Constantinople second only to the pope in authority. Worked to support orthodox Christianity against the Arianism promoted by King Odoacer. Benedictine Vallombrosan monk at Florence, Italy, taking the religious name John of the Holy Trinity. Developed a fascination with black magic, and began to study and practice it in secret, collecting occult and forbidden writings. Eventually found out and summoned before the abbot-general of the Vallumbrosans, John first denied his studies, then confessed. He was imprisoned by the Order, which proved to be his salvation. The solitude led him to true penitence, and some severe self-imposed autsterities. Seeing his conversion, his brothers asked that he return to the community, but he refused, preferring the saving solitude of his cell. He lived to old age as a hermit, writing, and receiving visions of Saint Catherine of Siena. Benedictine monk at the Saint Blase monastery in the Black Forest in Germany. Prior of Göttweig monastery in Austria. Monk at Formbach in Lower Bavaria (in modern Germany) in 1107 where he worked with Blessed Beregar. 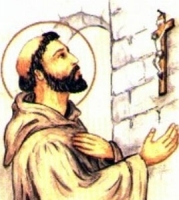 Abbot of Formbach on 29 October 1108. Noted for his personal austerities, he brought the reforms to religious life that he had learned in his previous houses. A miracle worker and healer, he oversaw a large expansion to the abbey. Monk at Lérins, France. Monk at Luxeuil Abbey. Helped Columbanus build the abbey in Bobbio, Italy. Served as its abbot from 615. During Attalas's abbacy most of the monks stood out against the severity of the Columbanian Rule. His monks included Saint Valery and Saint Blitmund of Bobbio. Son of the king of Cashel, Ireland, Kessel grew up a pious child, and was known as a miracle worker. Missionary bishop to Scotland in the area of Lennox and southern Perthshire, working from Monk's Island in Loch Lomond. May have been martyred at Bandry, Scotland, but records are unclear. His name was used as a battle cry by the Scots, and the Kessog oil field in the North Sea is named after him. Forty Christian soldiers of the Thunderstruck Legion of the Imperial Roman army who were tortured and murdered for their faith during the persecutions of Emperor Licinius. Christian Byzantine noble. Lady-in-waiting to the Empress Theodora in Constantinople. To escape the unwanted attentions of the Emperor Justinian, Anastaia fled the court to a convent in Alexandria, Egypt. On the death of Theodora, Justinian launched a search for Anastasia. To escape, she assumed a male identity and costume, and lived her remaining 28 years as a hermit in the desert of Scete. The story is believed by many modern scholars to be a pious legend. Dominican. Ordained in 1863. Founded the Dominican Sisters of Bethany in 1867; the sisters continue their work today with abused women in several European locations. Bishop of Jerusalem in 314. Fought Arianism. Participated in and signed the documents of the Council of Nicaea, and helped formulate the Nicene Creed. When Saint Helena discovered a collection of crosses, one of which was the True Cross, Macarius suggested identifying the real one by touching them to a seriously ill woman, and seeing which one cured her. Supervised the construction of the church of the Holy Sepulcher. Fed and ministered to prisoners who were arrested and tortured in the persecutions of Emperor Valerian. When the prisoners were taken into the court for their show trial and the judge began questioning them, none would speak. Finally Codratus called out from the gallery, "We are all Christians, servants of our Lord Jesus Christ." Martyr. Benedictine. Spiritual student and chief supporter of Saint Arialdo of Milan in the campaign against simony in Milan, Italy. Vallombrosan monk. Abbot of San Fedele at Strumi on the Arno. Peacemaker between the Italian cities of Florence and Arezzo. 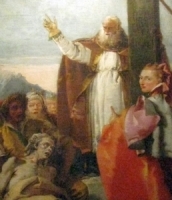 Biographer of Saint John Gualbert and Saint Arialdo. Relative of Saint Rumold. Priest. Died en route home from a pilgrimage to Rome, Italy. While he was apparently on his death bed, a young woman gave him a pitcher of water, which he turned into wine. Monk in abbies in Paris, France. Spiritual student of Saint Germanus of Paris. Abbot of Saint Symphorium abbey at Autun, France. First abbot of what became known as Saint Germain-des-Pres in Paris. Missionary preacher in the area of Apema, Phrygia (part of modern Turkey). Worked with Saint Alexander of Apema. Fought the Montanist heresy. Martyred in the persecutions of Emperor Marcus Aurelius. May have been the first person in Sweden baptized by Saint Ansgar of Hamburg-Bremen. Hermit in northern Sweden. Missionary preacher in the area of Apema, Phrygia (part of modern Turkey). Worked with Saint Caius of Apema. Fought the Montanist heresy. Martyred in the persecutions of Emperor Marcus Aurelius. Benedictine monk. Monk and then abbot at Lagny, France. Arrested, tortured and executed in the persecutions of Emperor Valerian. Marytred in the persecutions of Decius. Saint Augustine wrote about him. Benedictine monk. Abbot of Seir-Kieran abbey. Bishop of Ossory, Ireland. 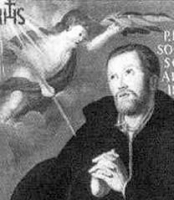 Friend of Saint Luanus. Abbot of Iona Abbey for seven years. Martyred in the persecutions of Maximian. Evangelist in Ireland with Saint Palladius of Ireland. I can find no biographical information on this person. A group of 42 Christians martyred in Persia in the 4th century.